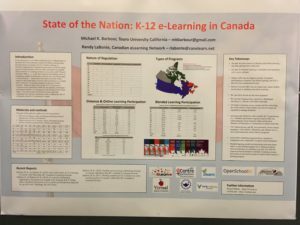 More blogging from the Digital Learning Annual Conference… Again on Tuesday our State of the Nation: K-12 e-Learning in Canada partnered research team also presented a poster session focused on the annual report. This panel examines K-12 online learning in Canada based on the 2018 edition of this on-going study. The session will begin with a brief description of the policies that govern and the level of activity of K-12 online learning in all thirteen provinces and territories, along with the various models that have developed across the country. Then the panel will outline some of the issues still facing K-12 online learning in Canada from the perspective of their individual programs. Below is a digital photo of the poster. Also, the actual PowerPoint slide is embedded below.